On the date shown, a family Bible was sold to a customer for $5. Small sales such as that belied the much greater business successes Gill had cultivated by the time this billhead received its paid stamp. Information on Gill was readily available and more than I had expected to find. I soon learned why from Gill's Wikipedia page. Gill started out in the bookselling business by marrying into it. A native from England, he had gone to Salem, Oregon in 1864 after living with his family in Massachusetts where they had emigrated. Married two years later, he began running the family's bookstore in Salem. 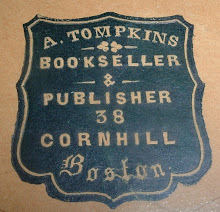 In short order, he purchased the business, but soon sold it and headed for Portland where he entered into a new bookselling business with George A. Steel--Gill & Steel. 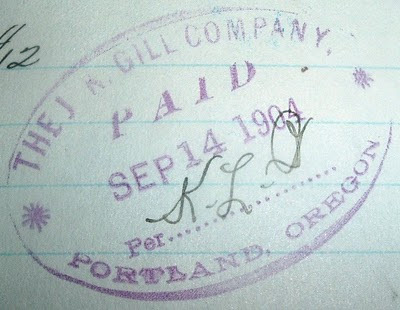 In 1878, Gill once again became a sole proprietor when he bought out his partner, Steel, and changed the name of the business to The J.K. Gill Company, which remained the name throughout the lifetime of the business. 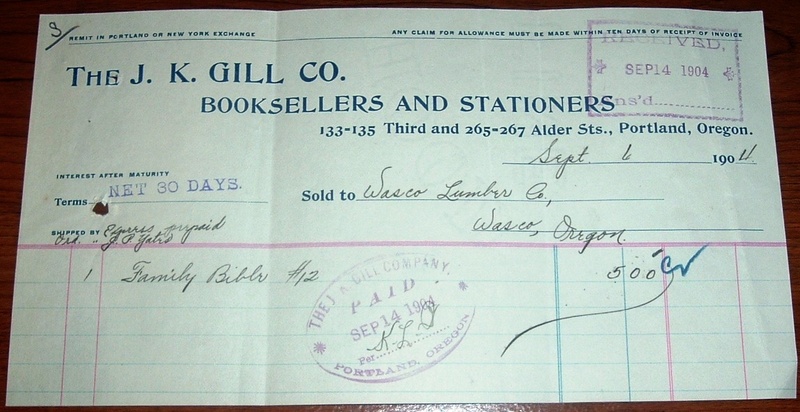 Gill expanded the business into stationery and office supplies and helped found the Columbia River Paper company as well as the Merchants National Bank. He also served on the boards of several local insurance companies. He lived a long, fruitful life, dying at age 90. But Gill's business continued to grow after his death, and by 1990 it consisted of 63 stores selling books, stationery, office supplies, and art supplies across four states. That was as big as it got. Before the decade was out, the J.K. Gill Company was out of business. Competition from the big chain bookstores and office supply stores was, apparently, a major reason for their demise. 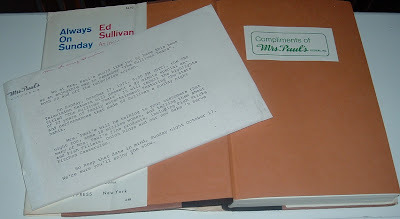 In researching J.K. Gill, I found the blog of the riverrun bookshop in Hastings-on-Hudson, New York, which offers more history of a personal nature from the 1950s. The blogger is Louisa Scioscia Stephens, daughter of riverrun's founder, Frank Scioscia and wife of riverrun's present owner. Both her parents worked at J.K. Gill's, if I have interpreted the blog posts on family history correctly. Stephens provides some nice, descriptive memories of the Portland store and includes a picture from the rooftop of J.K. Gill's 10-story building in Portland in 1945. Her account is a welcome addition to the factual chronology of Gill and his business. Her writing allows one to walk through the store and experience its charms and attractions, from the layout to the people who worked there. I always enjoy finding this kind of personal tie-in to a piece I'm researching. It helps breathe a little life into a business's ephemeral representation. 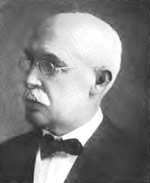 Wrapping up, here's the face behind the business's origins, found on the Wikipedia site--J.K. Gill, circa 1911. When is a book dealer not a book dealer? Maybe never, as long as books are offered for sale. 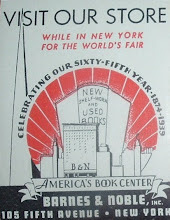 But diversification, which vintage ephemera confirms has long been a trademark of the bookselling business, can sometimes obscure the store's bookselling identity. Still, it's interesting to see the array of goods in various locations that got bundled with books in a store's inventory. Old billheads convey a good sampling of that business history. 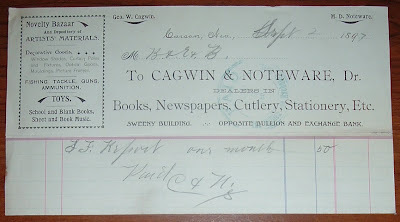 Examining this 1897 billhead from Cagwin & Noteware (great name!) of Carson, Nevada (Carson City, I assume), books are mentioned first in the tagline under the company's name, which makes me think of them as book dealers. 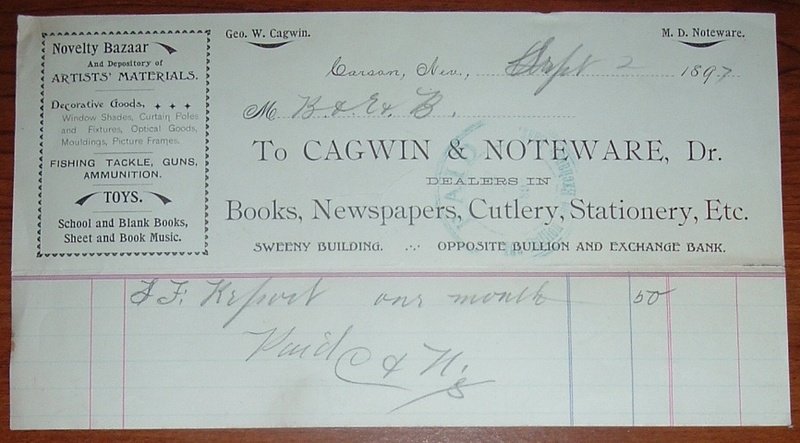 And I'm assuming here that Cagwin & Noteware's core business was books and related reading and writing matter. But books quickly fade into the background as you scan across the billhead below and the impressive offering of other goods. Newspapers, a common offering in book shops, is followed by the uncommon Cutlery and expected Stationery. Cutlery? Books and knives--why not? Carson City in 1897 was just a generation removed from the Old West. Check out the left side of the billhead and find more unusual items for a bookseller to stock. 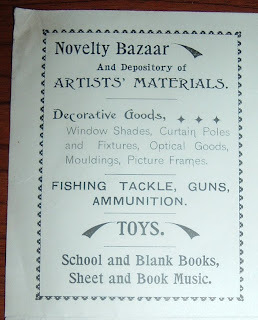 One could find artist's materials as well as decorative goods for the ladies (no gender bias intended, we're exploring the nineteenth century) that included window shades, curtain poles and fixtures, optical goods (not sure about the decorative qualities there), mouldings, and picture frames. 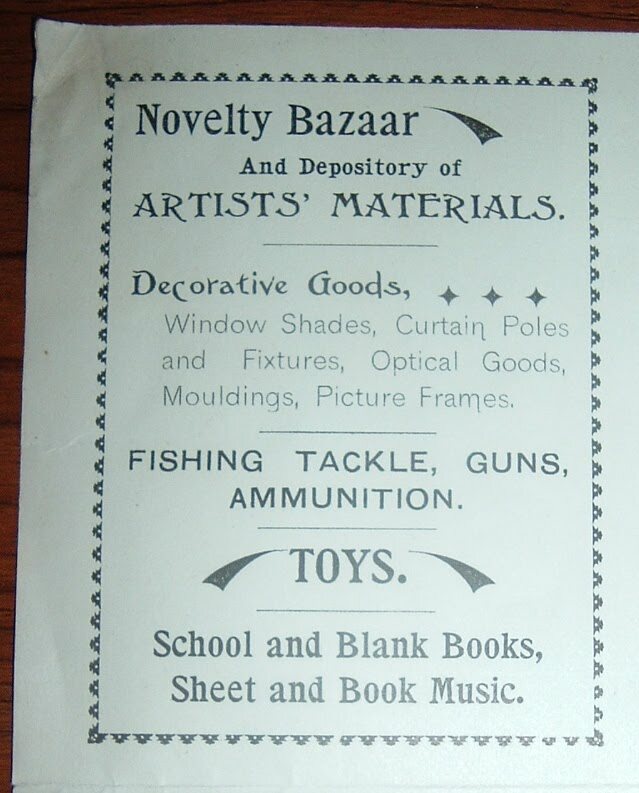 And not to forget the men (fishing tackle, guns, ammunition) or the kids (toys) or the students (school and blank books) or, last but not least, the musicians (music books and sheet music). Cagwin & Noteware had everything but a velocipede-power lathe... no, wait, they had one of those, too. The Nevada Appeal (present-day newspaper) has a column, Past Pages, that reprints interesting newspaper items from Nevada's past. A column from last month included something for Cagwin & Noteware, 120 years ago: All sorts: Don't fail to examine that patent velocipede-power lathe at Cagwin & Noteware ... constructed to work wood and iron. I was going to say Cagwin & Noteware sold everything but the kitchen sink, but I'm not so sure they didn't sell one of those at some point. As is the case today with many brick and mortar shops, a bookseller in earlier times had to diversify. Cagwin & Noteware got pretty creative with diversifying their inventory. Though they identified themselves as book dealers first, they were smart to offer a variety of things their customers needed and equally smart to advertise it on their billheads. 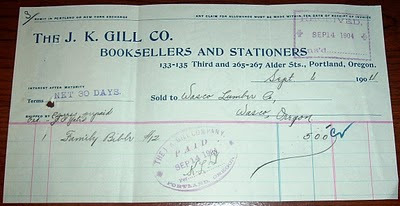 Some book dealers in certain areas just couldn't afford to be thought of as selling only books. 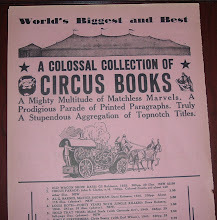 But I'll bet I never run across another book dealer who also sold velocipede-power lathes! An odd grouping for a post on this blog, eh? Perhaps it deviates a bit from the usual fare, but there is a book ephemera tie-in. Mrs. Paul's Kitchens gave away copies of Michael David Harris' book, Always on Sunday: Ed Sullivan, an Inside View (Meredith Press, 1968) to promote an October 17, 1971 CBS special on the Ed Sullivan years. 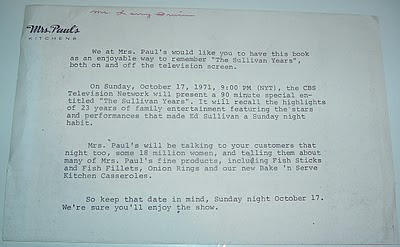 Sullivan's show had been off the air since June of that year. 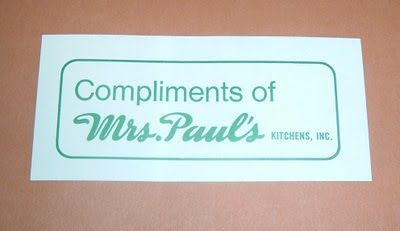 Inside the book, I found the letter from Mrs. Paul's Kitchens detailing all this, while also plugging their fish sticks and related products. 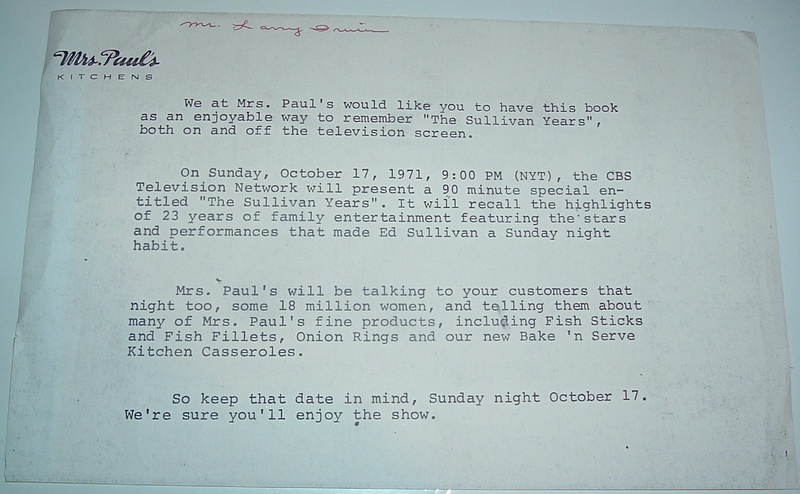 I remember both the Ed Sullivan Show and eating Mrs. Paul's Fish Sticks when I was growing up in the 1960s, so this had a good bit of nostalgic appeal to me (still enjoy old Sullivan clips, don't like the fish sticks!). 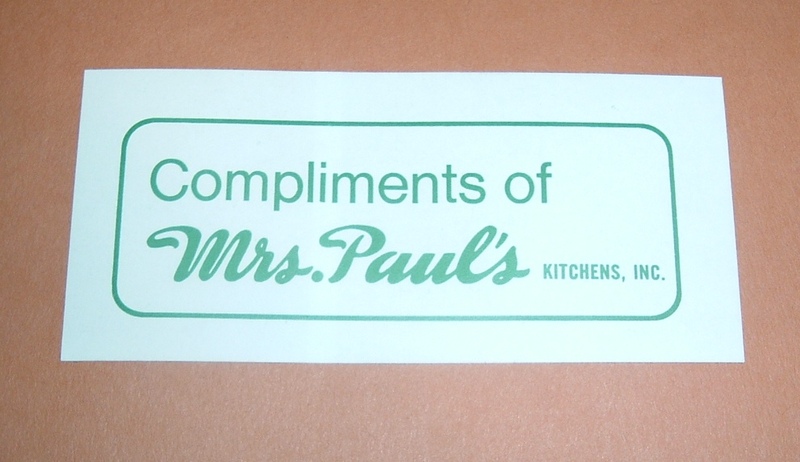 In addition to the letter explaining the reason for the gift book, there was a presentation bookplate affixed to the front free endpaper: Compliments of Mrs. Paul's Kitchens, Inc. Now there's a rarity for bookplate collectors! 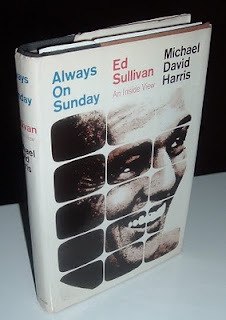 For anyone who remembers watching the Ed Sullivan Show, this book would bring back more than a few memories, I'm sure. In the photo section, I came across an act Sullivan booked that garnered a then-record 73 million viewers: The Beatles. They made their first appearance on the Ed Sullivan Show 47 years ago today--February 9, 1964. Their first appearance on February 9 is considered a milestone in American pop culture and the beginning of the British Invasion in music. The broadcast drew an estimated 73 million viewers, at the time a record for US television, and was characterized by an audience composed largely of screaming hysterical teenage girls in tears. The Beatles followed Ed's show opening intro, performing "All My Loving", "Till There Was You" which featured the names of the group members superimposed on closeup shots, including the famous "Sorry girls, he's married:" caption on John Lennon, and "She Loves You". They returned later in the program to perform "I Saw Her Standing There" and "I Want to Hold Your Hand". I just found this book and the promotional letter last night in a box in storage. 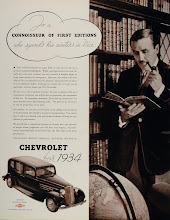 I thought it would be fun to write a quick piece more for nostalgia's sake than anything significant to contribute to this blog, given the letter's tenuous connection to bibliophemera. This morning, I heard a local newscaster comment about the Beatles making their first appearance on Ed Sullivan on this date. I checked it out and sure enough. What a coincidence! 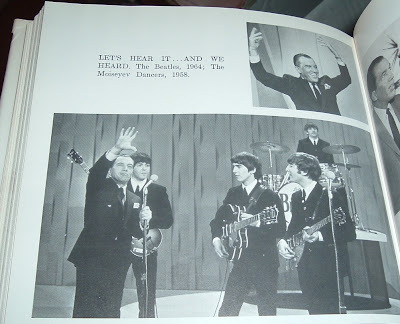 So I had to mention the Beatles here, too, and do it today on the anniversary of their first Ed Sullivan Show performance. They got top billing on that show 47 years ago, but only third billing today in this blog post, behind Ed Sullivan and Mrs. Paul. Doesn't seem right, but that was the order of discovery. Last month, I wrote about a lawyer and publisher in California, in 1898, sending a letter to Leipzig, Germany in an attempt to find a bookseller in Europe for his new book (see Any bookseller in Leipzig will do). He addressed it to Any Bookseller in Leipzig and hoped for the best. Notation on the envelope indicated he got lucky. 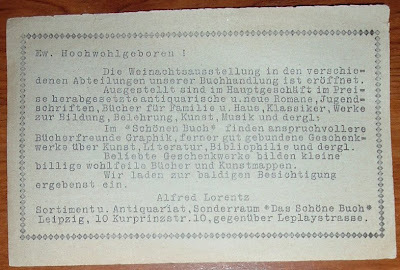 Alfred Lorentz apparently was the bookseller who received the letter. I thought a nice companion piece to that cover would be some ephemera from Lorentz's business. I got lucky and found something less than a month later. This looks like a "home-made" postcard or ad card from 1923 (postmark date). The paper is thinner than card stock and the piece is cut a bit uneven. Still it got the job done for business communications. 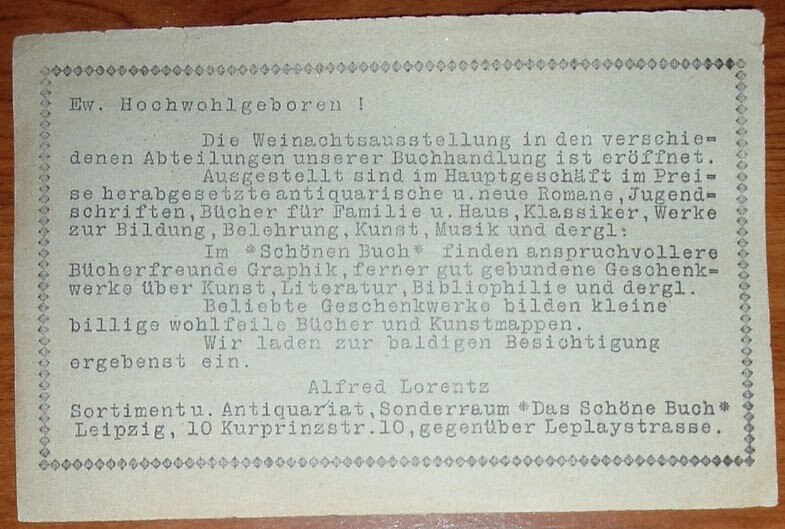 A rough translation of the message on the backside of the card indicates that Lorentz was selling everything from novelties to classic works of literature and the arts and sciences. He invites customers to come by and examine his stock. There is also mention of a special room where rare and antiquarian books can be viewed. I would expect to find philosophical works as well in Lorentz's stock. In researching this bookseller, I learned of his business relationship in the 1870s and 1880s with Friedrich Nietzsche, the German-born philosopher whose writings influenced well into the twentieth century such creative figures as Albert Camus, Sigmund Freud, Carl Jung, Gustav Mahler, Rainer Maria Rilke, Jean-Paul Sartre, George Bernard Shaw, Richard Strauss, and William Butler Yeats among many others (Adolph Hitler as well). Thomas H. Brobjer, in his book, Nietzsche's Philosophical Context: An Intellectual Biography, references the importance of Alfred Lorentz's book shop in Leipzig as a source of reading material for Nietzsche's library during the 1870s and 1880s. Brobjer's research of the ephemera related to their transactions, i.e., letters and billheads, revealed the connection between the bookseller and famous philosopher. 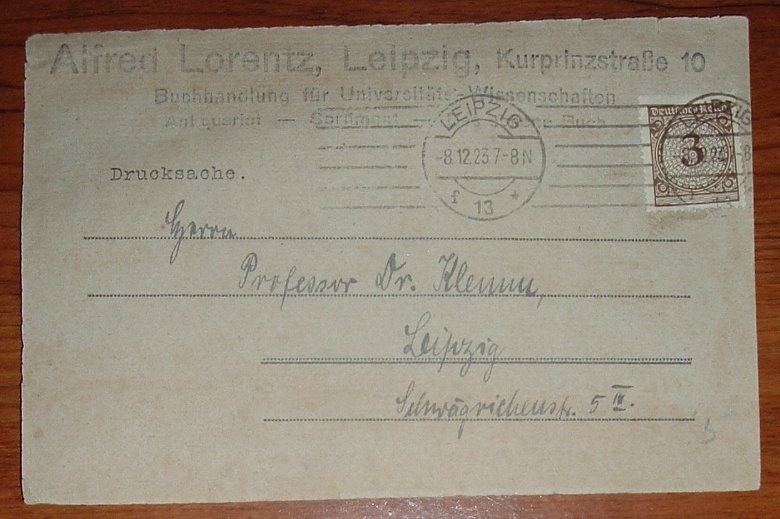 Some 40 or 50 years later, a postal piece of ephemera from Lorentz's book shop reveals his books were still sought by such individuals as the addressee, Professor Dr. Klemm in Leipzig. This would have to be Otto Klemm, author, editor, and Professor of Applied Psychology at the Institute for Experimental Psychology in Leipzig. 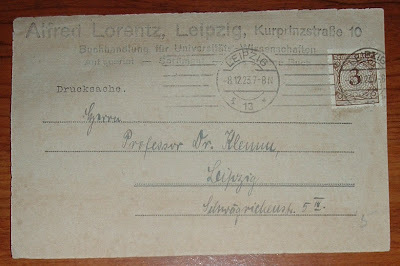 This time period from Nietzsche to Klemm, roughly half a century, is all I can find on the life of Lorentz and his Leipzig book shop that provided literature in the arts and sciences for many readers and thinkers, influential and otherwise. Perhaps the beginning and end or Lorentz's story can be found in further ephemeral pieces of his business transactions.